Amazon Studios today announced that the Amazon Original Movie Gleason will be available through Amazon Prime Video at no additional cost to Prime members on December 29. The acclaimed film is among 15 documentaries shortlisted for the 2016 Academy Award for Best Documentary, was nominated for Five Broadcast Film Critic’s Awards and was included among The National Board of Review’s Top Five Documentaries of the Year. 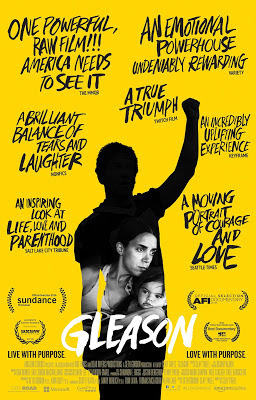 Gleason is directed by Clay Tweel (Finders Keepers) and features for New Orleans Saints player Steve Gleason, his wife Michel Varisco and Steve’s former teammate and best friend Scott Fujita (The Lightkeepers, FOX NFL Kickoff). The film is produced by Fujita, Kimi Culp (Oprah’s Master Class), Seth Gordon (Horrible Bosses, Identity Thief), Mary Rohlich (Four Christmases, The Goldbergs) and Kevin Lake (The Singing Detective, Paparazzi). The music for Gleason includes numerous songs that have inspired Steve throughout his life, like “Given to Fly” and “Just Breathe” by Pearl Jam, as well as two tracks, “Space In Between,” and “Her Again,” written by Steve Gleason himself and performed by his good friend, guitarist Mike McCready along with singer, Kim Virant, which will be available exclusively on Amazon Music Unlimited and Prime Musicbeginning December 23. Additionally, Steve created a playlist featuring some of his favorite songs, also streaming exclusively on both Amazon Music Unlimited and Prime Music. Not available on any other subscription services, Gleason will be available for Prime members to stream and enjoy using the Amazon Video app for TVs, connected devices including Amazon Fire TV, and mobile devices, or online at Amazon.com/originals, at no additional cost to their membership. Prime members will also be able to download the film to mobile devices for offline viewing. Gleason joins Prime Video’s line-up of award-winning and critically acclaimed Original Series and Movies—to see more originals available exclusively for Prime members visit www.amazon.com/originals. Amazon Studios launched in 2010 as a new way to develop feature films and episodic series—one that’s open to great ideas from creators and audiences around the world. Anyone can upload a script online for Amazon Studios to review, and those who choose to make their projects public can also receive feedback from the Amazon Studios community.First announced in January 2015, Amazon Original Movies is an initiative by Amazon Studios to produce and acquire original movies for theatrical release and early window distribution exclusively for Prime members. Like Amazon Original Series, Amazon Original Movies focuses on unique stories, voices, and characters from top and up-and-coming creators. In 2015 Amazon Studios released its first film, Chi-Raq from critically acclaimed filmmaker Spike Lee. Chi-Raq is now available for Prime members to stream exclusively. Kenneth Lonergan’s Manchester By The Sea is currently in theaters and up next Amazon Studios will release Jim Jarmusch’s Paterson on December 28th. In addition to Prime Video, the Prime membership includes unlimited fast free shipping options across all categories available on Amazon, more than two million songs and thousands of playlists and stations with Prime Music, secure photo storage with Prime Photos, unlimited reading with Prime Reading, unlimited access to a digital audiobook catalogue with Audible channels for Prime, a rotating selection of free digital games and in-game loot with Twitch Prime, early access to select Lightning Deals, exclusive access and discounts to select items, and more. To sign-up for Prime or to find out more visit: http://www.amazon.com/prime.